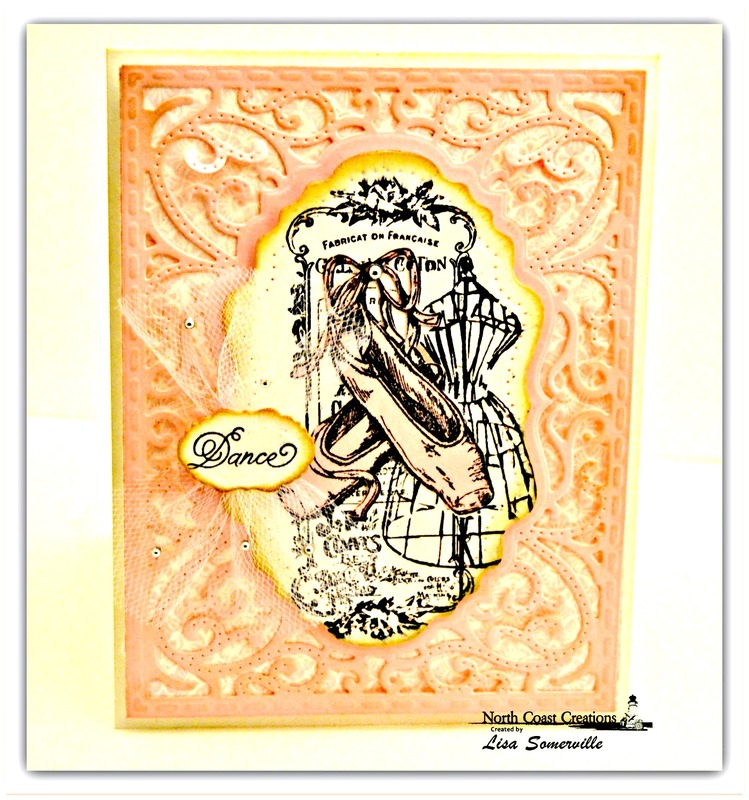 Today I'm sharing a card I created using North Coast Creations Ballet and Vintage Dress Form stamp sets. I collaged the images by stamping the Ballet shoes on white card stock, masking and adding the Vintage Dress Form. Wanting a little more "pop" to the Ballet Shoes, I stamped them again on Pink card stock, cut them out and paper pieced them to the collage. The stamped panel is die cut using Our Daily Bread Designs Vintage Labels Die, then layered on the Pink pink panel that was die cut using Our Daily Bread Designs Vintage Flourish Pattern Die. The White panel under the die cut was stamped in Pink using Our Daily Bread Designs Chalkboard Fan Background. To embellish I added Tulle, Silver Gems and a stamped label. Love how you collaged the stamps. great idea to combine with Vintage Dress Form, love the touch of tulle too! So pretty and so different! What a great idea to use the dress form with your ballet shoes! Love the tulle bow!! So beautiful! Love the Vintage Flourish frame in pink and how you combined the two images! How pretty, Lisa! Love the dress form behind the shoes and the die cut layer is perfect. Lisa this is genius! Love the collage!!! Pretty card! Love the tulle..looks so cool! !